The United Nations has designated the West-Eastern Divan Orchestra, made up of musicians from Israel, the Palestinian territories and other parts of the Middle East, as a Global Advocate for Cultural Understanding. The orchestra was co-founded in 1999 by Argentine-Israeli conductor and pianist Daniel Barenboim and the late Palestinian literary scholar Edward Said as an instrument of peace and tolerance. 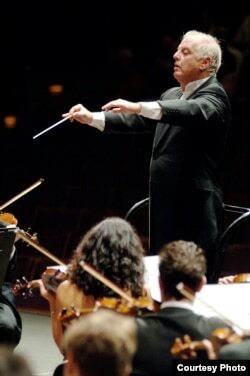 Within the orchestra, music is seen as a vehicle of cultural understanding. U.N. Secretary-General Ban Ki-moon said he appreciates the orchestra’s approach in fostering dialogue and tolerance. “Every performance is a testimony to the power of music to break down barriers, to promote cultural understanding and to build bridges between communities,” Ban said. 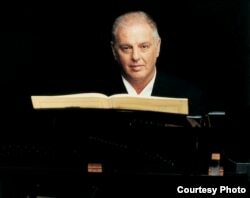 Barenboim, who has been a U.N. Messenger of Peace for nine years, said the orchestra would not spare any energy in fulfilling its mission. However, he added, there are limits to what it can do. Tyme Khleifi, 26, a violinist from the Palestinian city of Ramallah, has spent half her life as a member of the orchestra. She said she agreed that music alone would not solve the world’s problems. She also told VOA that coming from a conflicted part of the world as she does, it is not easy being part of such an orchestra. The musicians said that ultimately, success would come when the orchestra could play freely in Tel Aviv, Damascus, Beirut, Ramallah or East Jerusalem. The world would be a far better place, they said, if their political leaders knew the joy and fulfillment that comes with playing in concert with one another.